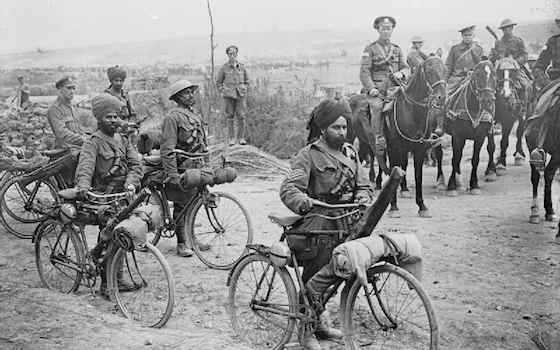 For decades the critical role played by India's 1.1 million-strong army in the First World War has been ignored. But that is changing and official remembrance activities lasting until 2019 are planned. India will dispatch representatives from regiments that fought in major campaigns in Europe, Mesopotamia, East Africa, Gallipoli and the Middle East to participate in events planned at these locations, beginning with Bastille Day celebrations in France in July 2014. Indian Army personnel and bands will also take part in tattoos, including the closing ceremony of the 2014 Commonwealth Games in Glasgow. And, in conjunction with the British authorities, India will honour six of 11 Indian First World War recipients of the Victoria Cross by putting up 'memorial markers' in their villages. The homes of three of these VCs are now in Pakistan. The two remaining VCs were from Nepal but at the time the British Indian Army comprised volunteers from all three countries. The participation of Pakistan and Bangladesh in commemorating the Great War is down largely to private initiatives. India's commemorative calendar includes a proposal to loan a Royal Flying Corps SE5a biplane, painted in the national colours of saffron, white and green, for demonstrative flights across the country. This will pay tribute to Second Lieutenant Indra Lal Roy, 19, from Calcutta, India's first flying ace. He was posthumously awarded the Distinguished Flying Cross in September 1918 for registering ten enemy kills -- two of which were shared -- over a 13-day period in his SE5a. First World War accounts are dominated by the horrors of trench warfare which most assume involved only Europeans. A total of 47,746 Indian soldiers died, 65,000 were wounded and 13,000 won gallantry medals in the fighting. The Indian Army's contingent was the war's largest volunteer force, but it had no native officers in combat units until late 1917. India expected that its participation in the war would be a rite of passage to nationhood, or at the very least to securing Dominion or local self-government status similar to Canada's. When after 1919 it became clear that this was not imminent, it provided a stimulus to Mahatma Gandhi's fledgling independence movement.